What’s the point of Quick Play? What’s the point of Quick Play? It’s stupid. It’s ruined community servers, it’s strangled community content and it DOESN’T EVEN WORK CORRECTLY. It’s simply not worth using. And I’m going to give you a bunch more reasons why you shouldn’t bother touching Quickplay. use the Server Browser. It’s way better. Here’s why. The Server Browser has way more options than Quickplay. Quickplay’s options are all hidden behind a little button, that you have to click. The Server Browser though displays all the settings that a server currently has: number of players, map, server tags (which tells you whether crits, damage spread, respawn times and alltalk have been altered). If you want a particular setting, you’ll have to remember which one to search for, but it’s not hard. There’s far more options available though, since Quickplay only offers a choice of Game Mode, server host, random crits, damage spread, server capacity and respawn times. Even then, there’s nothing in between, so if you want a server free from bots or one running SMAC or a custom game mode, you’re screwed. 2. Choose the map you want. Quickplay doesn’t actually let you pick what map you want to play on. That is, unless you want to play Doomsday, which is currently the only Special Delivery map. You pick a game mode, but if you pick Capture the Flag, you probably don’t want to play CTF_Sawmill or CTF_2fort for the billionth time. Or maybe you do. With Quickplay, nine times out of ten, you’ll be thrown onto a Valve server that runs one game mode and cycles through maps for said game mode. With the Server Browser, you can pick exactly what map you want. If you’re lucky, you’ll find a 24/7 server with your favourite map. Particularly 2fort. 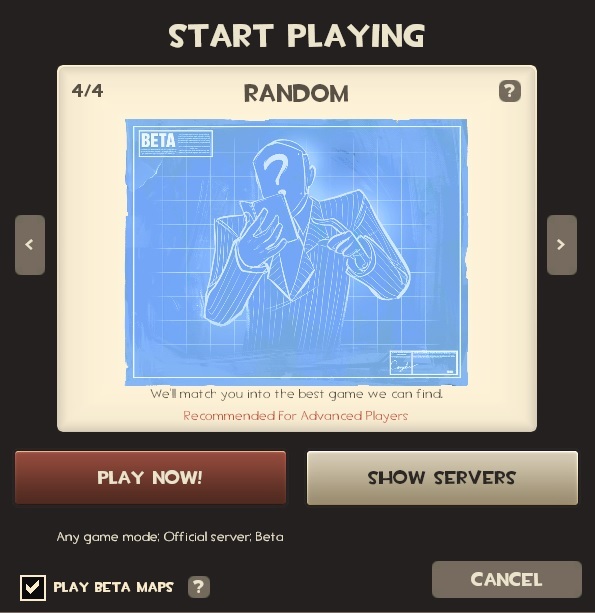 You can find beta servers alongside normal servers in the Server Browser. 4. You don’t need a random button either. Just close your eyes and pick at random. Lazy. 5. Quickplay blocks out ALL custom content. When I say all custom content, I mean all custom content. Except in the past, when Saigns servers used to be the number one destination when using Quickplay. Okay, some custom content is considered annoying, like Quake kill sounds. Some custom content though is fun and amusing, like custom maps, TF2x10 and VS Saxton Hale. And Dodgeball. And Freak Fortress. And Randomizer. And so on. There’s also game modes that are left out that exist to try and balance TF2, like TF2Tightrope. But it’s not just custom content, official content is left out too! You can’t play Medieval Mode, Arena or Territorial Controle via Quickplay. The Server Browser allows you to set a server location. Want a server in Europe? You can find one with Quickplay. Want one in America? Sure. Don’t want ten billion ping? The Server Browser is there for you. Quickplay doesn’t care. Quickplay just throws a server at you. The Server Browser gives you legitimate choice. You can sort by a number of different values, particularly Player Count, Map and Ping. The Server Browser shows you everything. Quickplay does everything hidden away in the background. You don’t see what servers it comes up with. You don’t know where you’re going until you’ve arrived. You don’t even know what map you’re going to play until it’s searched through an unknown list of servers, chugging in the background before plonking you into something that may or may not match your search query. 9. The Server Browser is far less likely to send you to an empty 300 ping server. Quickplay does this all the time. It just chucks the first server that matches your query at you, not caring whether there’s people in the server or anything. Okay, occasionally you’ll join a server and the map will have changed or something, but at least you’ll know in advance that you have joined a server with an acceptable amount of ping. Valve, PLEASE get rid of Quickplay. We’re not idiots. Why I play League of Legends Five reasons why I’m not pre-ordering Overwatch Come on already! Thoughts on Scream Fortress VIII Happy Jump Day!